With this Sundays matchup between the NY Giants and Tennessee Titans has opened up a wound that had barely healed. 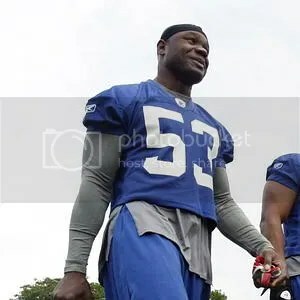 Keith Bulluck will be facing his former team (Titans) for the first time since signing with the NY Giants. Bulluck spent the first 10 years of his career with the Titans; his departure from Tennessee was not received well by fans as reports surfaced that Bulluck was not even offered a contract by the Titans. Those reports were backed by Keith in his first statements to the media after signing with the Giants. Head coach of the Titans Jeff Fisher gave a different version of the story when he stated that Bulluck had desires of playing for his hometown team and that the Titans had interest. Up until this week that was were the story ended… When Bulluck met with the Nashville media earlier this week he reiterated he side of the story. I predict Bulluck will have a strong game as he will not only be up to play against his old team, but he will also be looking to help the Giants bounce back from the disappointing lost to the Colts. I have been to a bunch of Titans games and I have enjoyed every single last one of them.